This pattern contains the instructions for three different sized bowls. The Basic Bowl measures 8 1/2" wide x 3" deep, Bushel Basket 12" wide x 10" deep and the Catnap Bowl is 14" wide x 6" deep. A great range of projects suitable for 2 1/2" strips. 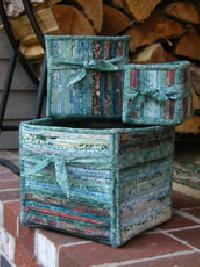 This clever covered box measures approx 10" wide x 5" high x 10" deep. 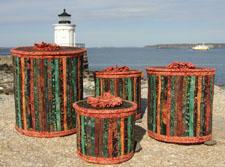 This item can be completed using 34 x 2 1/2" strips using 18 for the box and 14 for the covering lid. 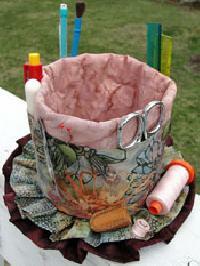 A brilliant project for Bali Pops and Jelly Rolls. 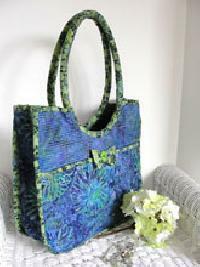 This colourful bag is a very useful size. 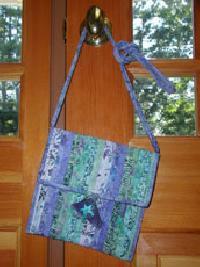 Measuring 12" high x 12" wide x 6" deep it will be a wonderful addition to your bag stash. 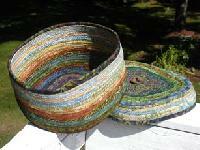 Bali Pops and Jelly Rolls are excellent as it is completed using a variety of 2 1/2" strips. 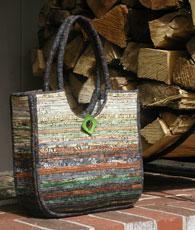 This great carry all measures 13" tall x 15" wide x 4" deep. 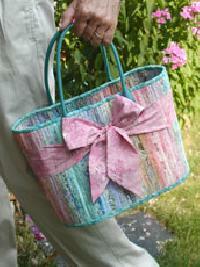 It is made using 40 x 2 1/2" strips therefore Bali Pops and Jelly Rolls are perfect. This set of nested boxes gives instructions for three sizes 4", 6" and 8" square. 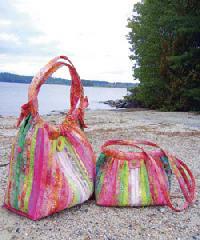 These designs are completed using 2 1/2" strips therefore packs such as Bali Pops and Jelly Rolls are perfect. This mini messanger bag with a 42" long shoulder strap, has two 5" square pockets on the inside for your mobile phone or iPod. Great for travel or anytime your want to carry just the basics. The completed bag measures 8" x 8". 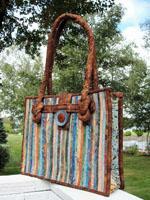 This beautiful shaped bag measures 14" wide x 10" tall x 8" deep. It can be made using a variety of 2 1/2" strips therefore Bali Pops and Jelly Rolls are perfect for projects like this one. This is a very practical bag with plenty of pockets. 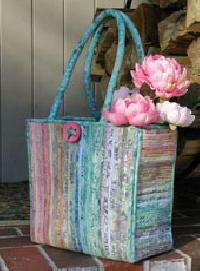 Make the bag from pre-quilted material, or quilt and fuse your own fabric for a bag that is just a little bit sturdier. The completed bag measures 15" wide x 13" tall x 5" deep. 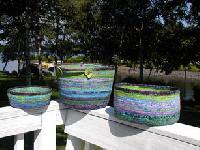 The instructions for these canisters include four sizes: Large 7 3/4" tall x 7 1/4" wide, Medium Large 6 1/4" tall x 6 1/2" wide, Medium 5" tall x 5 1/2" wide and Small 3 3/4" tall x 4 3/4" wide. The Flower Pot Caddy is a handy item to gather sewing tools and catch your errand threads. The completed pot is approx 5" tall and 5" wide. This pattern includes directions for two bags and two baskets. The Fortune Cookie Bag measures 10" x 7", Fortune Cookie Long Bag measures 16" x 6", the Fat Quarter Basket measures 11" x 6" x 5" and the Project Basket measures 12" x 8" x 4". These projects can be completed with just two fat quarters and a few 2 1/2" strips. 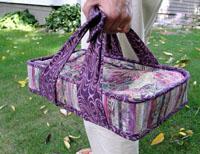 Perfect for carrying a 9" x 13" casserole or hot dish to any event. Use on the table as a casserole cozy and trivet. Four cover layers keep casseroles toasty warm until you are ready to eat. Then just fold under to give added protection to your table. 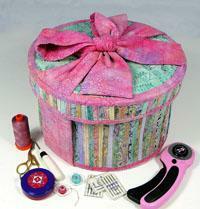 This sewing basket is a beautiful way to store all your hand-sewing needs. Wide enough for large scissors plus there are four inside pockets which will keep all your special tools sorted. Bali Pops and Jelly Rolls work really well for this project. A simply classic tote bag with four interior pockets and unique figure eight knotted handles. At 13" wide x 10" high it is a perfect size for carrying all sorts of items. Bali Pops and Jelly Rolls work perfectly for this project. 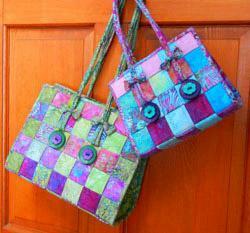 This pattern includes the instructions for two different sized bags. The large bag in 13"W x 9"H x 5"D and the smaller design is 9"W x 7"H x 5"D. This pattern is completed using 2 1/2" strips of fabric. This pattern includes the instructions for two different sized bags. The large bag in 16"W x 15"H x 6"D and the smaller design is 11"W x 9"H x 3"D. This pattern is a great way to use up 2 1/2" strips of wadding and fabrics.